I recently had a change request against a SharePoint Forms Library I had created a few years ago – the request was to adjust the permissions so that form submitters could see only the forms that they’ve submitted (and not others). 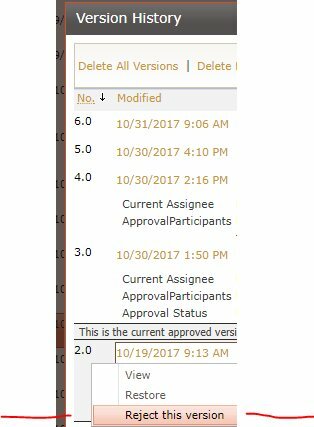 However, enabling these settings seems to have caused the items that already existed to have an Approval Status of “Approved, ” despite a pending Approval workflow. This caused the undesired effect of allowing users who do not hold the “Approve” permission level to access a previous version of items still in the approval workflow. I needed to reject previous versions of forms where the current version had not yet been approved. On lots of items. I found numerous examples from google how to use PowerShell to set the Approval Status of list items; however, nearly every example dealt with only the current version of a list item – making no mention of altering the approval status of previous versions of list items. None of these options accomplished what I was seeking: to simply remove the approval on previous versions. Today I had an issue with a SharePoint 2013 List Workflow not running on a SharePoint Online Team Site. Timestamp: 2017-10-30 14:07:03Z ---> System.Net.WebException: The remote server returned an error: (400) Bad Request. So – If you’re not yet using Microsoft Flow and still need those SharePoint 2013 Workflows, remember to enable this site feature.